Trial By Sapphire: I Call It My "Office Chic Mom-er Bomber"
I Call It My "Office Chic Mom-er Bomber"
Or in plain terms, a bomber jacket. My best trick for dressing the belly for work has been to wear a stretchy, solid-colored top (yet another shout-out to the Merona tank tops!) paired with a scarf, sweater, or jacket. By doing this, I've been able to get so much use out of my non-maternity wardrobe! I can continue to add to my closet without worrying that I'm wasting money on clothes I'll only use for eight weeks (at most) and then give away. I've had loved all of my past eShakti dresses (links below), my favorite being the third dress. Little did I know that I would get pregnant two weeks after that post... which means I only got to wear it one more time before my belly declared it too snug. I was so happy when they offered to send me something from their holiday line. The dresses were out of the question, but there were so many jackets to choose from! I love this Geo Print Front Ponte Bomber Jacket with its subtle flair and clean look. It's perfect to wear on the weekend or at the office (which I did yesterday). 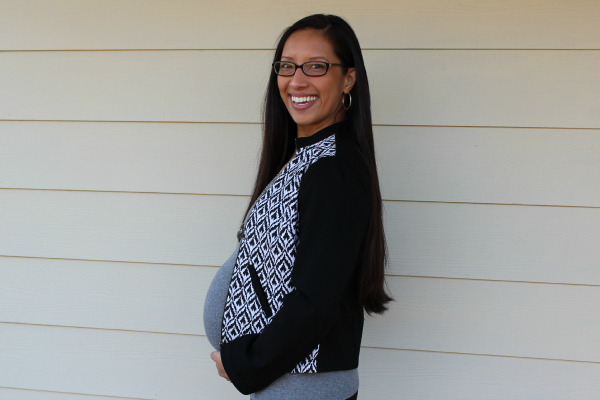 I'm so glad it will work both with and without this baby bump, but for now, it's my "Mom-er Bomber." ;) What do you think? New eShakti customers will receive a $25 gift coupon. Scratch that! $35 for a limited time! * eShakti sent this jacket to me to review. All opinions are my own. Looking fab!! 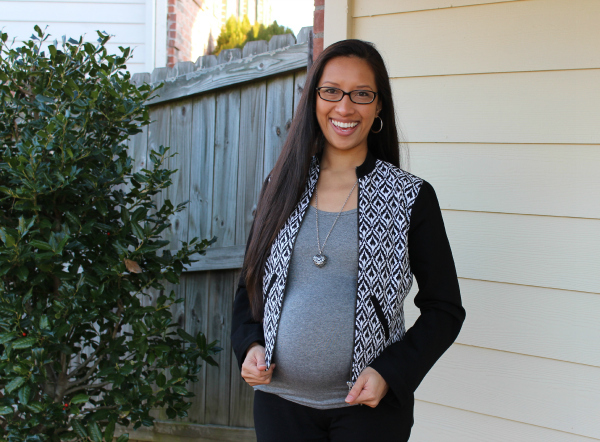 Love the idea of layering with non maternity items. I wish I could have done that more but having an August baby is a sweltering experience, that's for sure!! 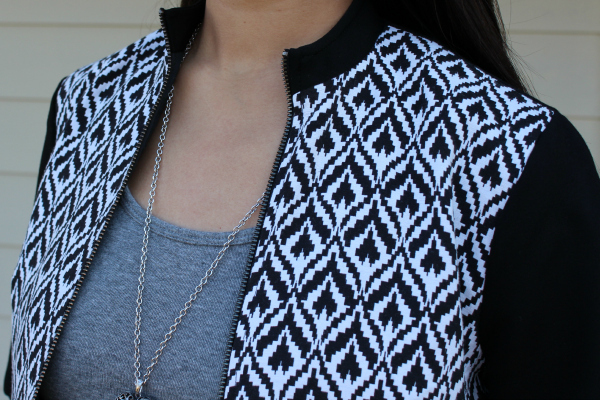 Love the print on that vest! What a super stylish mama! How cute! I'm love this pattern on you!